From left to right: three of the “other administrators and high officers” (verse 4) who looked for fault in Daniel. 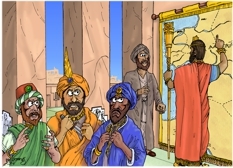 Daniel (in grey robes), king Darius (in red and gold robes). I designed Daniel’s features and clothing in December 2009, which is almost 8 years before the date of drawing and colouring up the rest of the scenes in this set of Bible Cartoons! I have decided to draw three administrators in some of these scenes, who represent all of the wicked “administrators and high officers”, who wanted to bring down Daniel. The Bible says Darius set up 120 high officers (satraps) to govern the empire (verse 6:1). That was just too many to draw in a single scene, so I have drawn just these three to represent them all. The administrators are dressed in rich, colourful clothes, befitting there station in the empire. 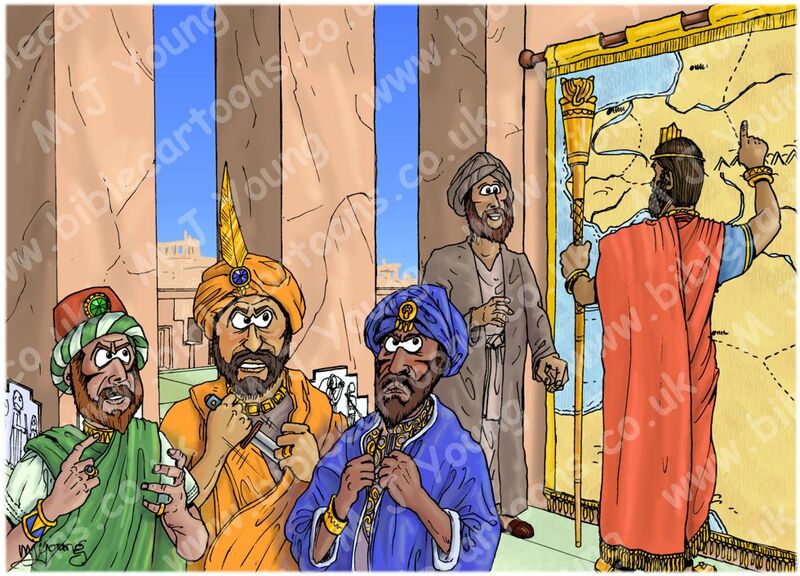 I’m sure Daniel would also have been presented to the king in rich robes, but having drawn him in simple grey linen robes in the past, I decided to keep his robes as previously drawn, to maintain continuity between the scenes of this story. I enjoyed drawing the administrators with murderous, evil looking expressions, grumbling amongst themselves against Daniel in this scene! We can see the western portion of the tapestry map of the empire of Darius in this scene, including the Mediterranean sea, Cyprus, Israel, etc. The previous scene (scene 1) shows the eastern portion of the empire.